The M104 E32 3.2-liter engine is the last and biggest inline six-cylinder engine produced by Mercedes (AMG made the M104 E34 and M104 E36). It appeared in 1991. The 3.0-liter M104 was the start point for the new 3.2l version. The main differences are the new cylinder block, new 89.9 mm pistons and new crankshaft with bigger 84 mm stroke. The cylinder head is the same as M104 E30 with four valves per cylinder. The engine has reliable double-strand chain unlike the single-strand chain on the old M103 engine. In 1992 the engine got variable geometry intake manifold. The manufacturer produced the 2.8-liter and 3.0-liter versions also (M104 E30 and M104 E28). The next generation of 6-cylinder engines got V configuration. 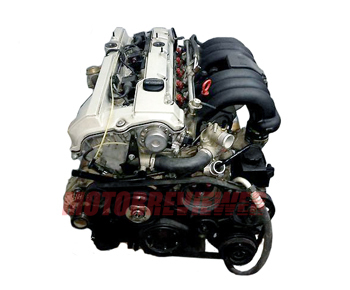 V6 engines released in 1997 as M112 series (3.2-liter engine is M112 E32). 1. Oil leaks from gaskets under the cylinder head cover and oil filter. 2. Engine overheat. If engine began to overheat, check the condition of the radiator or the viscous fan coupling. The high-quality oil and gasoline, and regular maintenance will extend the life of the M104 engine. This engine is one of the most reliable Mercedes-Benz engines. M104.990 - 231 hp engine for Mercedes-Benz 300 SE/SEL W140 (1991-1993). M104.991 - the same M104.990 but for Mercedes-Benz SL320 R129. M104.992 - M104.991 with compression ratio 9.2, power is 220 hp. Engine is for Mercedes-Benz 320 E W124, E320 W124 (1992-1997). M104.994 - M104.990 engine with another intake manifold. It power is 231 hp and torque - 231 ft lb. Mercedes-Benz S 320 W140 (1993-1998). M104.995 - 220 hp and 231 ft lb engine for Mercedes-Benz E 320 W210 (1995-1997).